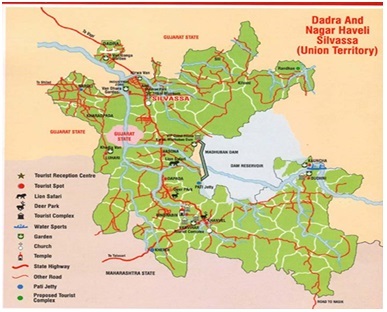 Dadra and Nagar Haveli is a Union Territory in Western India. Nagar Haveli is wedged between Maharashtra and Gujarat, whereas Dadra is an enclave 1 km NW, surrounded by Gujarat. The shared capital is Silvassa. The larger part spans a roughly c-shaped area up-river from the city of Daman on the coast, at the centre of which, and thus outside the territory, is the Madhuban reservoir. It came into existence on 11 Aug. 1961.
estimated at $218 million in current prices. Read more:festivals of Dadra and Nagar Haveli , Gk , General Knowledge , Gk on Dadra and Nagar Haveli , Dadra and Nagar Haveli Tourism , minerals in Dadra and Nagar Haveli , natural resources in Dadra and Nagar Haveli , dances of Dadra and Nagar Haveli , Dadra and Nagar Haveli language , Dadra and Nagar Haveli capital , Dadra and Nagar Haveli festivals , dadra and nagar haveli resorts , dadra and nagar haveli tourist attractions , Dadra and Nagar Haveli facts , Union Territories Of India.